Included 3 types of powerful X Rare such as [GranWalker Brahma] with brand new effect [Gran Force] and new Brave card [Saga Brave]! Also included special Banshin Dan ver. [Diamond Wall]! Use [Saga Brave] and battle!! On sale April 13th(Sat. ), 2019! 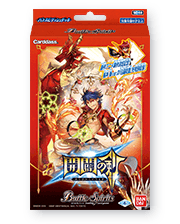 * The cards included in this pack may be used in official tournaments from April 13th(Sat. ), 2019. * Since the cards are prearranged, all boxes’ contents are identical. * Due to the type of the product, all boxes have duplicate cards. [There was a text misprint on the package of the [SD48] Dash Deck - The Sword of Creation. We sincerely apologize to all customers and official persons for the trouble we have caused. No new packages with the corrected text (mentioned above) will be available for exchange.